The Vermont DMV’s case against a licensed mechanic accused of involuntary manslaughter describes not only how the suspect allegedly failed to keep current with procedures and botched the inspection but how other automotive professionals missed what the DMV depicted as obvious mechanical issues. Read the affidavit here. In that document and in our coverage, we’ve redacted the names of the other parties who allegedly also missed the damage, as they have not been accused of any crimes. The mechanic accused in the case, Steven Jalbert, 30, has pleaded not guilty to the accusations of involuntary manslaughter and reckless endangerment, according to WPTZ. “We really don’t have any comment at this time,” Jalbert’s attorney Harold Stevens told Repairer Driven News last week. Stevens told the Burlington Free Press in an Aug. 11 article that it seems like the state would have a hard time proving that Jalbert was guilty beyond a reasonable doubt given the time between the inspection and crash. He also told that newspaper the defense would likely hire its own expert mechanic to look at the case. While driving down a hill in Barre, Vt., in July 2014, 86-year-old Donald Ibey’s brakes “gave out” with a “loud pop,” according to his son Barry Ibey’s report to the DMV. Donald Ibey’s 1992 Chevrolet Corsica then sped down the hill and struck a tree stump, killing Ibey’s wife, Elizabeth, 83. 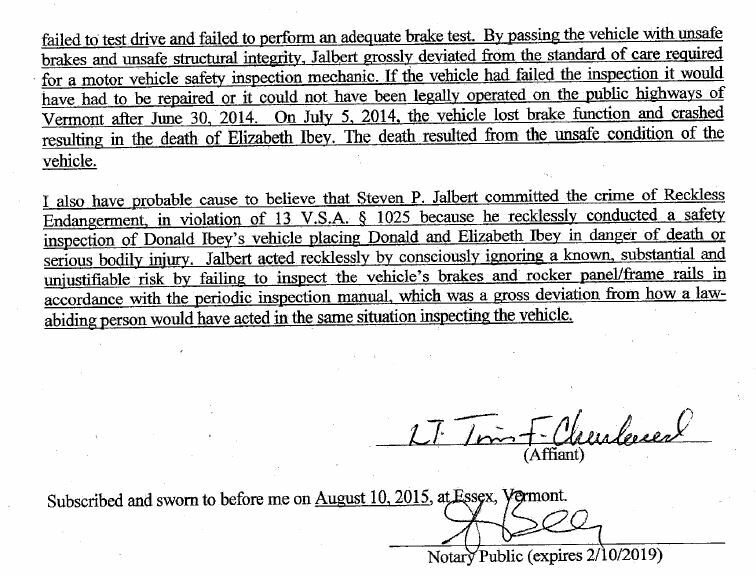 Despite Ibey’s comments to his son and a tow truck operator who noticed frame rot and brake fluid on the ground, the Barre Police Department concluded “operator error” — Ibey had pressed the clutch instead of the brake, according to the affidavit. A mechanic at the city’s garage also said the brakes were fine, the DMV reported. But Barry Ibey asked the DMV to verify those results before he told them to his grieving father. DMV inspectors worked with certified inspector George Maglaris of Maglaris Auto on another vehicle examination, and Maglaris offered a theory that the Corsica’s frame rails were rotted, resulting in the engine being pushed into the passenger side of the car instead of underneath it. 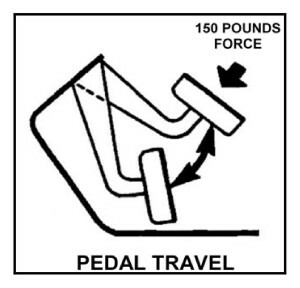 Maglaris also tested the brakes, and “the tires on the vehicle rotated freely … indicating the brakes were not functioning,” DMV Detective Lt. Tim F. Charland wrote in the affidavit. A brake fluid reservoir also “was not full,” but appeared to contain fluid because it was out of level, Charland wrote. “It was then we observed extensive rust, corrosion and deterioration to the vehicle right and left side rocker panels/frame rails,” Charland wrote. “The amount of deterioration of the panels significantly reduced the structural integrity of the vehicle to withstand a front-end collision. At that point, Charland wrote, investigators concluded there was enough evidence to support brake failure causing the crash, not driver error — and a vehicle inspector should have seen all this coming. “The conditions observed were in plain view and should have been easily noticed and recognized during an appropriate Vermont Safety Inspection,” Charland wrote. All of them are reasons to fail an inspection, and everything except the ruptured brake lines “would have clearly been present” during the last inspection in May 2014 — and probably in a 2013 inspection too, the affidavit states. When investigators met Jalbert, whose name allegedly was on the last inspection, he recalled Donald Ibey as a regular customer for three years who’d had a rear brake line replaced in 2012. Jalbert also recalled the other three lines being “seriously rusted” and recommending replacments to Ibey, “but Ibey declined his suggestion for whatever reason,” Charland wrote. The Corsica was inspected less than a month after that repair, and again in 2013 and 2014, and Jalbert agreed it would have been inspected with the rusty brake lines, the affidavit states. Charland wrote that it appeared as though Jalbert felt Ibey should have replaced the brake lines but didn’t consider that the shop had done “faulty inspections” for three years in a row. Jalbert allegedly did the 2012 and 2014 inspections; the 2013 inspector has not been accused of a crime. Jalbert at first said he put the Corsica on a lift, but then acknowledged he might not have done so, according to the DMV. “It could have just slipped,” he said, but still calling it “slim to none” he wouldn’t have elevated the car, according to Charland’s account. The mechanic acknowledged that frame rails so deteriorated “does not pass” but said he was told that rusted brake lines don’t fail so long as they aren’t leaking, according to the DMV. Those curious to learn more about state and federal laws which could affect their business — particularly California businesses — should check out “Protect Your Business From Fines and Disciplinary Actions by the CA Bureau of Automotive Repair” by attorney Jack Molodanof and “U.S Wage/Hour Compliance Under the FLSA – Are Your Pay Systems Legal?” and “California Wage/Hour Compliance – The Wolf is At The Door, Are You Ready?” by attorney Cory King. The courses are being presented at the SEMA Show as part of the Society of Collision Repair Specialists’ Repairer Driven Education series. Register here. The latter was true for the 2007 inspection manual which Jalbert said he used, but wasn’t true for the 2013 manual he should have been referencing for the May 2014 examination, according to Charland. 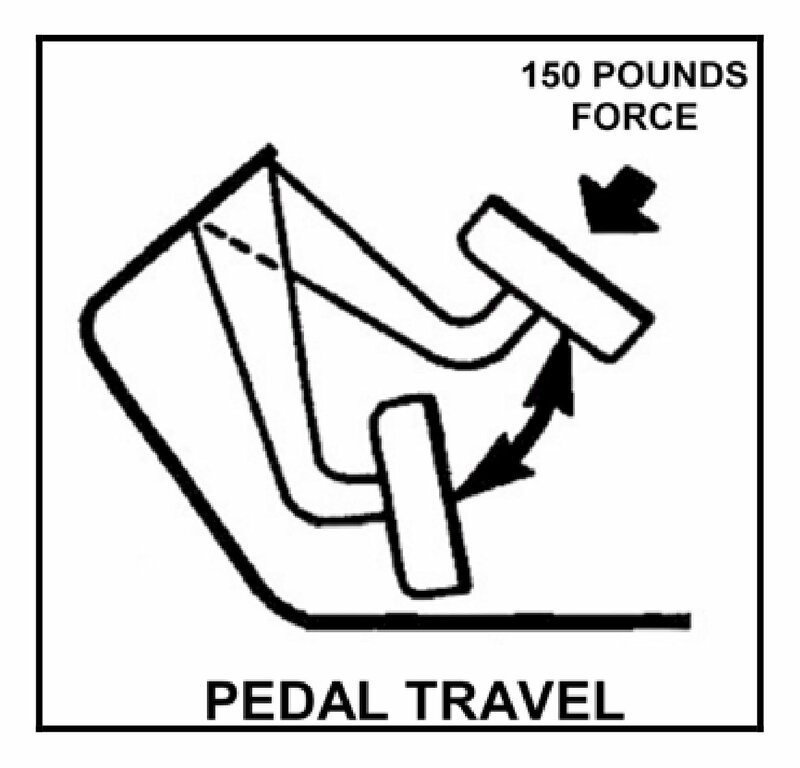 Both years’ manuals call for a test drive and applying 150 psi of pressure to the brakes, and the 2011 manual and those succeeding it also require the inspector to remove a tire. Jalbert said he hadn’t tested the brakes with a pressure gauge to simulate a hard brake (he said he didn’t know about the 150 psi requirement), nor did he remove a tire — even though he said he knew the latter was a requirement — according to Charland. The mechanic said he didn’t test-drive the Corsica either, the affidavit states. Not only was Jalbert using a six-year-old manual to inspect cars, he had a “clean, fresh” 2013 manual unopened in a manila envelope lying on a shelf “under other materials,” according to Charland. Earlier, Jalbert had told investigators he hadn’t received any newer manuals, the affidavit states. When investigators returned later to obtain the 2007 manual, Jalbert said he threw it out to avoid using an outdated document further. 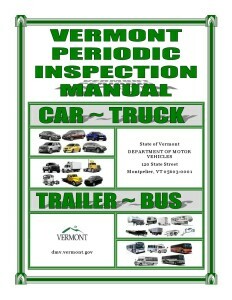 “He pointed to a manual on his office desk they were currently using and I observed it to be the 2011 Vermont Periodic Inspection Manual,” Charland wrote. The 2013 manual the investigators had found and showed Jalbert was on a shelf, the DMV wrote. When told of Elizabeth Ibey’s death and his possible involvement, Jalbert “displayed no signs of remorse or concern over his involvement,” according to Charland. “In fact, he showed more concern about their inability to conduct vehicle inspections in the future,” Charland wrote. Jalbert is the only one facing charges, but the DMV’s affidavit recounts other parties flat-out missed issues with the Corsica. The Barre municipal mechanic said he lifted the vehicle and checked underneath during the city’s crash investigation, and while he realized he had hit the clutch once instead of the brake, a subsequent brake press found pressure. When Charland showed him the photos of the deteriorated brake lines and “rotted rocker panels/frame rails,” the city mechanic “appeared very surprised,” according to the affidavit. “(The mechanic) then offered that his examination … was performed very quickly and was very ‘cursory,'” Charland wrote. The mechanic was “surprised he missed what we discovered,” he wrote. Also, eight days before the inspection, a mechanic at a local Chevrolet dealership — who was also a certified inspector — changed the Corsica’s oil and did a “27 point courtesy inspection,” according to the DMV. That mechanic did note on the invoice “Rockers getting tender” and recalled during the investigation that when the lift arms raised the Corsica, “the rocker panels began to buckle and collapse from the weight of the car as a result of the rusting,” the document states. The mechanic said the rusting on the driver’s side found by investigators was similar to what he saw then, though the passenger-side deterioration wasn’t as bad, according to the DMV. Had it been a formal state inspection, the dealership mechanic said he wouldn’t have OK’d the car. The mechanic couldn’t recall what, if anything, he specifically told Donald Ibey about the car’s rockers, but figured he would have talked about the “Rockers getting tender” item on the invoice, according to the DMV. “I asked (the mechanic) if he would have had any kind of a conversation with Ibey about the car not being safe to operate on the road, and (the mechanic) replied, ‘No. I just said that he’s going to need to do things and probably a couple other things he’s going to have to do very soon,'” Charland wrote. The mechanic recalled telling Ibey that there were safety issues, but not that they would prevent the car from passing an inspection, the affidavit states. He couldn’t remember Ibey’s response. It’s unclear if the dealership’s 27-point inspection checklist included brake lines at that time, though a current checklist does include brake lines, the DMV said. The mechanic told Charland he checks “easily visible brake lines” typically but couldn’t recall if he checked the lines then, the DMV document states. Regardless of the outcome of the case, the kind of situations described in the document should scare collision repairers who aren’t making an effort to stay current in their craft or are otherwise not doing quality repairs (whether out of laziness, sloppiness or speed pressure). Substitute “outdated OEM repair procedures” for the alleged “outdated DMV inspection manual,” and it’s not hard to see a crucial calibration or scan being missed or a repair being done incorrectly.